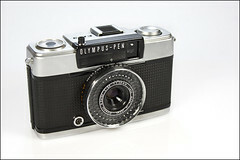 The Pen series is a family of half-frame cameras made by Olympus from 1959 to the beginning of the 1980s. 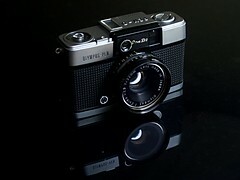 Aside from the Pen F series of half-frame SLRs (discussed in its own article), they are fixed-lens viewfinder cameras. The original Pen was introduced in 1959. Designed by Maitani Yoshihisa, it was the first half-frame camera produced in Japan. It was one of the smallest cameras to use 35mm film in regular 135 cassettes. Its name comes from the idea that the camera was as portable as a pen. The concept was soon copied by many other Japanese makers. In 1966 the arrival of the Rollei 35, a camera almost as compact but making normal 24×36 exposures, would announce the beginning of the end for the half-frame concept. 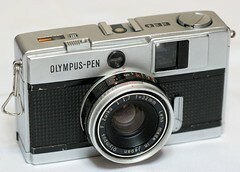 However, Olympus went on producing the simpler models of the Pen family until at least 1983. 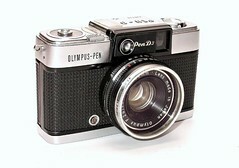 17 million Pen half-frame cameras were sold. In the descriptions below, please note that the focal lengths indicated do not give the same angle of view as for full-frame cameras: 30mm on the Pen is roughly equivalent to 45mm on a full-frame, and 28mm to a 40mm. 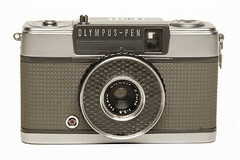 The original Pen is a very compact half-frame camera, with just a viewfinder, no meter and fully manual settings. It has a 28mm f/3.5 D Zuiko lens. Its shutter settings are 25, 50, 100, 200, B; its aperture range from 3.5 to 22. It has a PC Sync terminal at the lower-left of the lens. The back is removed completely for film loading and unloading. 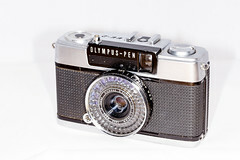 The first of these cameras were made for Olympus by a sub-contractor, Sanko-Shoji but Olympus began making the camera themselves within a year. The Pen S is almost the same camera, with the following shutter settings: 8, 15, 30, 60, 125, 250, B. It existed in two versions, with a 30mm f/2.8 lens or an f/3.5 lens. The Pen D was a more expensive model than its predecessors, launched in 1962. 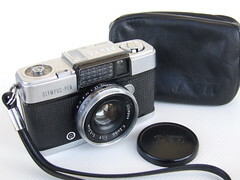 It has a 32mm f/1.9 F Zuiko lens, a shutter going to 1/500 and an uncoupled selenium meter. Film speeds ranged from 10 to 400 ISO. The Pen D2, launched in 1964, is the same model with an uncoupled CdS exposure meter replacing the selenium one. 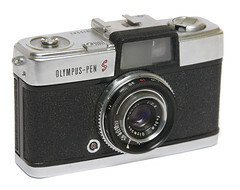 The Pen D3, launched in 1965, is the same with a 32mm f/1.7 lens. The Pen E family is easily recognized by the selenium meter window around the lens. 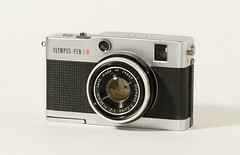 The first member of the Pen E series was the Pen EE, introduced in 1961 and was a model targeted at amateurs, with fully automatic exposure and fixed focusing. It is a true point and shoot camera, and has a 28mm f/3.5 lens. There were two sub-versions of the EE, the first version had one shutter speed of 1/60th of a second which was used both for flash and non-flash modes. Later versions of the EE had two shutter speeds, 1/250th of the second and 1/30th of a second. In flash mode, the shutter was automatically set at 1/30 of a second, and in non-flash mode the shutter would automatically switch between 1/250 and 1/30 depending on light conditions. For both of these sub-versions of the EE, the aperture range was f3.5 to f22 and the ISO range was 10 to 200. The Pen EE could accommodate both 22.5mm or 43.5mm filters. The main way to distinguish between the older EE and the newer sub-version was the material used to clad the camera. The older model used a leather-like material and the newer model used a "basket-weave' pattern (usually in grey) such as in the example illustrated in this article. 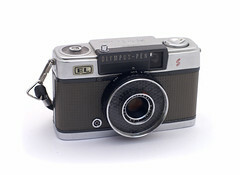 The Pen EE-S, launched in 1962, is the same model with a 30mm f/2.8 and a focusing ring, made necessary by the wider aperture. Most of the specifications were similar to the EE (although the shutter speeds were 1/200 and 1/40, like the later EE-2). In 1966 the two cameras were slightly modified and became the Pen EE (EL) and Pen EE-S (EL) with a modification of the take-up spool to make film loading easier. EL stands for Easy Loading. You can only recognize them by a small label marked EL stuck on the front, or you can open them and look at the take-up spool. 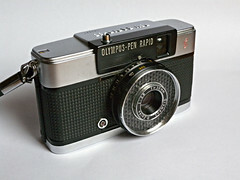 The Pen EE-D, produced from 1967 to 1972, is a more expensive automated-exposure model, with a CdS meter, a focusable 32mm f/1.7 lens and a hot shoe. Film speeds were 12-500 ISO. The EE-D were wider than the typical EE camera. The Pen EE-2, produced from 1968 to 1977, is nearly the same as the Pen EE with the addition of a hot shoe and an automatic exposure counter. The film speed range was changed to reflect more modern emulsions. It now ranged from 25-400 ISO. Shutter speeds also changed to 1/200 and 1/40th of a second (compared to 1/250 and 1/30th in the EE). The EE-2 could only accommodate the larger (43.5mm) filters. The Pen EE-S2, produced from 1968 to 1971. It is a modernized version of the EE-S, with the addition of a hot shoe and the ISO range modified for more modern films (25-400 ISO). 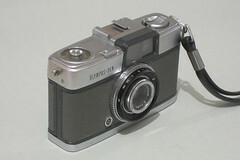 The Pen EE-3, produced from 1973 to 1983, seemed to be exactly the same camera but also added the flashmatic system. When used with a matching GN14 flash, the flashmatic system allowed the user to obtain a corrected aperture value by manually setting the aperture ring to one of the estimated distances (1-4m). The Pen EF, launched in 1981, was the last Pen model. It is like the Pen EE-2 or Pen EE-3, but with a small built-in flash, and was only sold in black finish with white letterings. Shutter speeds were 1/30 and 1.250 and film speeds ranged frrom 25-400 ISO. The Pen W or Pen Wide is a very rare variant of the Pen S model, with a wide-angle 25mm f/2.8 lens, equivalent to a 35mm in full format. It only exists in black finish, and has a cold flash shoe. It was only produced between 1964 and 1965, and today fetches high prices on the collectors' market. 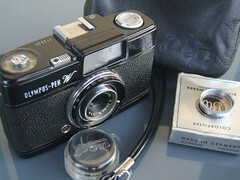 The Pen EM, produced from 1965 to 1966 features an electronic shutter, automatic film advance, automatic rewind and shutter speeds from 30 seconds to 1/500th. 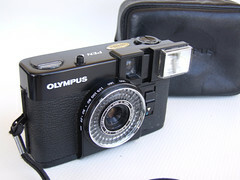 It has a F. Zuiko 35mm f/2 lens and a CdS exposure meter allowing automatic or manual exposure. Despite being an advanced camera for it's time production was ceased after one year due manufacturing problems that could not be overcome with the technology available at the time. The Pen Rapid EE.S and Pen Rapid EE.D were variants of the Pen EE.S and Pen EE.D designed to accept the Agfa Rapid cassette instead of the regular 35mm cassette. They were both made from 1965 to 1966, and met very little success. In 2009 Olympus launched a series of digital cameras for the new Micro Four-Thirds lens mount (µ4/3) that it shares with Panasonic. Whilst the original Four Thirds cameras were DSLRs with optical reflex viewing, Olympus' new digital Pen series all belong to the new class of mirror-less system cameras. The camera body omits any viewfinder eyepiece, but an electronic viewfinder can be attached on the accessory shoe. With the many adapters available for the Micro Four-Thirds mount, the new Pens became the first purely electronic system cameras usable with most legacy lenses from earlier manual-focusing camera systems. 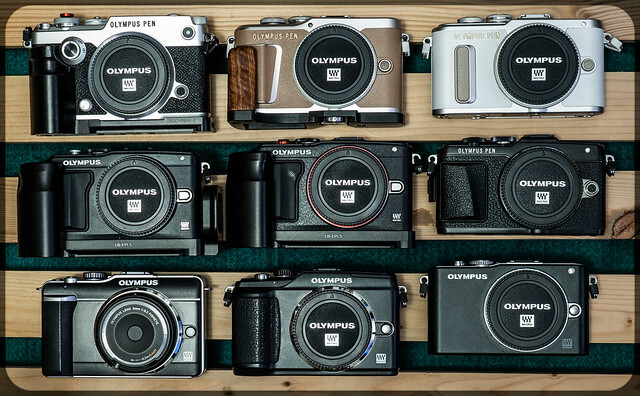 There was no E-PL4 because the four is an unlucky number in Japan. ↑ McKeown, James M. and Joan C. McKeown's Price Guide to Antique and Classic Cameras, 12th Edition, 2005-2006. USA, Centennial Photo Service, 2004. ISBN 0-931838-40-1 (hardcover). ISBN 0-931838-41-X (softcover)., p.749.